A star for young children (Chagollan) – Joyce's mystery and fiction book reviews with some non-fiction too! This is a charming book. Have you and your child ever looked up at the night sky to study the constellations? Do you make up stories about them? Can you recall their names? 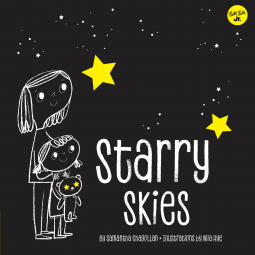 This clever book, illustrated in gold, black and white for the nighttime setting, shows pictures of children dreaming and wishing and then shows the appropriate constellation. For example, “In the sky tonight, Oscar dreams of a starstruck crowd of fans,” is followed by the constellation Taurus for Oscar the matador. This is a lovely book for a young child. They will love the repetition of theme and the cozy feel of this read aloud.